True Crime Uncensored: Host Burl Barer is Guest Burl Barer! “I WAS going to be the guest on my own show Saturday, but then recalled that I had booked a fabulous guest — the Jewish mobster inside the Mafia mob wars in Boston, and co-author of ROGUE MOBSTER!”……Burl Barer quote! When the infamous gangster Whitey Bulger went on the lam in 1995, the streets of Boston became a war zone between the Mafia and the renegades, with the Winter Hill Gang looking on. 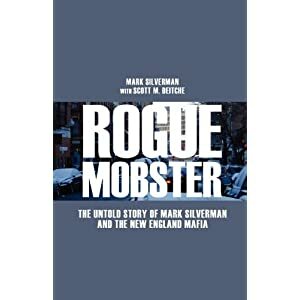 Co-written by Mark Silverman with Scott Deitche, Rogue Mobster: The Untold Story of Mark Silverman and the New England Mafia chronicles the inside story of the Boston mob wars of the 1990’s when over two dozen gangsters were killed in a vicious war for control of the Boston underworld. Rogue Mobster is told in the words of Mark Silverman, an outsider from Medford who got inside the mob and became an integral part of the ensuing war. His account is the first-ever inside glimpse into what went on at the street level, why people were killed, and what the stakes were. Silverman grew up in the shadow of Whitey Bulger, Howie Winter, Raymond Patriarca and Jerry Anguilo, bosses of Boston’s most infamous crime families. With a Jewish last name, his opportunities should have been limited in Boston’s Irish/Italian underworld, but he moved up quickly, gaining acceptance across the board. Silverman was ‘made’ in the Patriarca Family as a reward for infiltrating a renegade mob faction backed by a New York family. The book begins with a unique history of the Boston gangland scene and takes the reader up to the late 1980’s, when a change in the Patriarca crime family leadership started a war between the loyalists to the regime and a renegade faction, backed by the Luchesse crime family of New York. Characters like Whitey Bulger, Mafia boss Cadillac Frank Salemme, and renegade boss Paul DeCologero became major players in the complex mob scene. Silverman recounts the shifting alliances and friendships that were torn apart as the various mob factions battled for control of the Boston underworld through the early 2000’s. Rogue Mobster is a firsthand account of the violent Boston mob wars of the 1990s, when bodies were piling up across New England and Mark Silverman was walking a tightrope between Winter Hill and the Mafia. The regular host of True Crime Uncensored, Burl Barer, brilliant award winning media mogul, will be in the guest seat for the hour to expound upon his book, HEAD SHOT! Along with co-host, Howard Lapides, and the gang at the Lighten Up Lounge, Burl brings his brand of wit, humor and vast knowledge of everything to the weekly show. But, how will he turn out as a guest? Tune in to find out as the tables turn and he is interviewed! Available from Amazon in paperback and Kindle and all other online book retailers, or ask for it at your local book store! Listen to True Crime Classics with Burl Barer and Don Woldman Thursdays 1pm ET on Here Women Talk!